Los Angeles is estimated to have more than 10,000 miles of sidewalk, and more than 4,600 miles of it needs to be repaired. These poorly maintained sidewalks present a real threat of injury to regular people going about their day. Parents headed down the street to work, teens headed to the bus stop, even small children running carefree down the block – to all of these, a poorly-maintained sidewalk can present an often-underestimated hazard and cause severe injuries. The Salamati Law Firm fights for fair compensation for victims of sidewalk falls. From slipping on ice to tripping on sidewalk cracks, we tackle each case with a focus on the unique issues it presents. With decades of experience successfully pursing premises liability claims, we have the knowledge and experience to represent your rights in an uneven sidewalk lawsuit. Tripping on cracks, whether from uneven settling of segments, destruction by tree roots, or some other cause of uneven payment. Stepping in potholes that can form from changing weather or damage that causes holes to break in the concrete. Ice and snow, which are often deceptive, in that they can be difficult to see, but also extremely slick. Tripping on debris left in the path, including household items or yard waste. In certain circumstances, you can sue for a sidewalk injury. The question will be whether whoever owned or was responsible for the sidewalk was negligent. Sidewalks are not private property, but the adjacent property may be, which could have an impact on your case. The municipality knew or should have known about its condition. When it comes to private property owners, they have a responsibility to not cause a dangerous condition on the sidewalk. For example, if the roots of a tree planted by the adjacent homeowner causes an uneven sidewalk injury, the homeowner can be held liable. The question of who is responsible for sidewalk maintenance and repair can be trickier in Los Angeles than in other cities. The general rule in California is that the cities own the sidewalks, but that the property owners are responsible for their maintenance and repair. In Los Angeles, however, there has been a major settlement between the city and an ADA (Americans with Disabilities Act) lawsuit because the notoriously bad condition of LA’s sidewalks present accessibility challenges for those with disabilities. 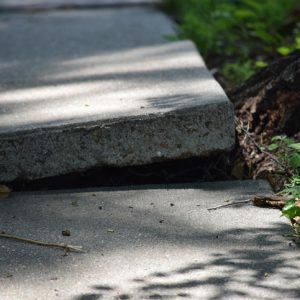 In fulfilling its end of the ADA lawsuit settlement, the City of Los Angeles has adopted the Safe Sidewalks LA program, under which it will reimburse property owners for half the repair cost, up to $10,000. Still, this sidewalk maintenance responsibility is not uniform across the state, or even across Southern California. To know who might be responsible for your injury, speak with a sidewalk slip and fall accident attorney at the Salamati Law Firm. Do you need a sidewalk accident lawyer? Technically, you can pursue a sidewalk injury claim on your own, but it is not advisable for several reasons. First, when dealing with a fall in Los Angeles, the city has instituted a claims process, but it does not work to the benefit of those injured. The city denies nearly all claims, but does not always inform the claimants of the denial. This threatens the statute of limitations, which means the claimant can lose the right to file a personal injury lawsuit. Second, in these types of cases, defendants often aggressively target the victims to pass the blame. They will dig for evidence that the injury occurred because the plaintiff was doing something careless like sending text messages rather than watching the path, or claim that the injuries were pre-existing conditions. As someone who has already sustained physical, financial and emotional loss from an accident, it can be stressful to undergo this type of pressure. Sean Salamati provides a buffer for clients; all of the defendants’ requests must go through him. At the Salamati Law Firm, we work side-by-side with the various experts needed to prove these factors so we can maximize your compensation, while you focus on recovering. There are a lot of details to align when dealing with a sidewalk injury claim. To make sure you present your best case, speak with a Los Angeles slip and fall lawyer from the Salamati Law Firm. Call today to schedule a free case review.